Exposure to potentially traumatic events puts individuals at risk for developing a variety of psychological disorders; the complexities involved in treating them are numerous and have serious repercussions. How should diagnostic criteria be defined? How can we help a client who does not present with traditional PTSD symptoms? The mechanisms of human behavior need to be understood and treatment needs to be tested before we can move beyond traditional diagnostic criteria in designing and implementing treatment. No better guide than Retraumatization exists to fulfill these goals. 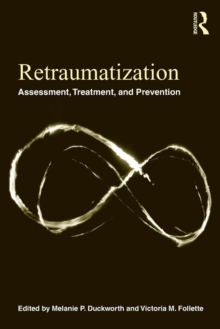 The editors and contributors, all highly regarded experts, accomplish six objectives, to:define retraumatizationoutline the controversies related to itprovide an overview of theoretical modelspresent data related to the frequency of occurrence of different forms of traumadetail the most reliable strategies for assessment to provide an overview of treatments. Contained within is the most current information on prevention and treatment approaches for specific populations. All chapters are uniformly structured and address epidemiological data, clinical descriptions, assessment, diagnosis and prognosis, and prevention. It is an indispensible resource that expands readers' knowledge and skills, and will encourage dialogue in a field that has many unanswered questions.